To assess the skills, experience, and interests of applicants. 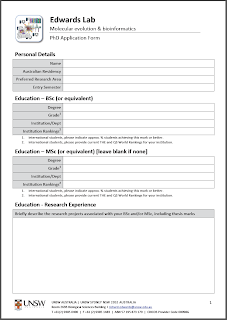 To assess key CV points for those intending to apply for UNSW Scholarships. 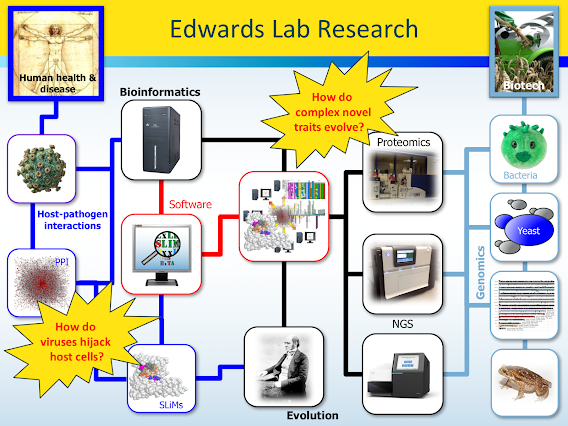 The lab does not currently have any funding for students but I am happy to receive applications from funded students and students wishing to apply for UNSW scholarships or other schemes. Please check the UNSW key dates page for application deadlines etc. - students may want to delay their application and strengthen their experience/CV in the meantime. Informal enquiries are welcome but generic “Dear Sir/Professor” emails will be ignored. Please read this blog post, “How (not) to apply for a PhD”, before applying. Note: Applicants with insufficient bioinformatics experience will not be considered (see below). It is simply too much of a risk (for both student and supervisor) to take such a student on, as not everyone takes to purely computational work. You must also demonstrate good communication in English, which includes all email communication. Yeast genomics using long-read PacBio sequencing. We are particularly keen to get a student to work on aspects of our ARC Linkage grant, investigating the evolution of a novel biochemical pathway in yeast. De novo whole genome sequencing and assembly of the cane toad. The role of gene duplication in the evolution of snakes. The development of diploid genome assembly analysis tools. Predictions of molecular mimicry from host-pathogen interaction data. Exploring the role of SLiM mutations in cancer and other human diseases. Development of a database of SLiM predictions. Benchmarking, optimising and extending SLiM discovery tools. There is no single perfect applicant profile: please provide a frank and honest appraisal of your interests, skills and future goals in your application. Completed applications forms should be emailed with a CV and degree transcript to richard.edwards@unsw.edu.au. Please name each file with your family name, initials and document type, e.g. PDFs are preferred but MS Word *.docx files are also OK. Remember: attention to detail is very important in bioinformatics. Boxes in the application form may be resized but please keep answers succinct; you will be judged on the quality of your writing. Note: Applicants will also need to submit a formal application through the UNSW Graduate Research School. This is not recommended until an agreement has been made to sponsor your application. Please also note that any agreement to sponsor your application is not agreement to take you on as a student. The final decision regarding supervision will not be made until after all of the applications have been received and processed by UNSW. Applicants for undergraduate projects (Honours/SVRS) or Masters programs should use the same form but indicate the program that they are applying for. All projects are 100% computational. To be considered as an international PhD applicant, you must have completed at least one 100% computational project as part of your undergrad or masters, or have equivalent computational experience (e.g. work placement as a programmer or data analyst). Taught courses are not sufficient at this level unless you can also provide some evidence of skill at scripting/programming, such as an extensive body of work at Rosalind. Unfortunately, the risks are simply too high otherwise. For those who cannot access Methods in Molecular Biology, the final submitted draft of our recent paper is now available here. A new download of SLiMSuite (release 2015-01-07 ) is now available at both UK (U. Southampton) and a new Australia (UNSW) mirror. See the SLiMSuite Blog for more info.